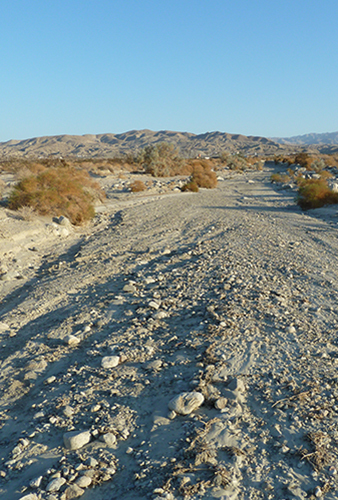 The Thousand Palms Flood Control Project is a series of planned flood control improvements in the Thousand Palms area of Coachella Valley in Riverside County. The project consists of a series of levees and channels to convey flood waters away from developed areas, thereby providing flood hazard protection to the community of Thousand Palms. The project also includes a series of conservation easements to mitigate for approximately 550 acres of floodways that would be created by the project on the Coachella Valley Preserve, which is protected through implementation of the Coachella Valley Multiple Species Habitat Conservation Plan. Aspen originally worked on this project in the late 1990s, to produce a joint Environmental Impact Statement (EIS) and Environmental Impact Report (EIR), under contract to the U.S. Army Corps of Engineers (Corps), Los Angeles District. As part of the EIS/EIR effort, Aspen conducted a biological reconnaissance of the project’s 40 square mile study area and mapped the native plant communities throughout the area. The Corps was the federal lead agency for the project, and the Coachella Valley Water District (CVWD) was the local sponsor and CEQA lead agency. The Corps approved the project with the publication of a Record of Decision in 2000. However, the project was not built at that time due to issues encountered during the engineering of the approved project. In 2011, the Corps initiated a new environmental review of the project in order to address development that had occurred in the area since approval of the 2000 EIS/EIR, as well as changing environmental conditions that had occurred since 2000 and project modifications that were developed to address these changed conditions. Aspen prepared this supplemental analysis, which was referred to as a “Preliminary Draft” Supplemental Environmental Assessment (SEA), with the intent of finalizing and publishing the document at some point in the future, pending funding. The Preliminary Draft SEA was based on the 2000 EIS/EIR and focused on environmental impacts that could occur as a result of changed conditions and/or project modifications. Aspen also conducted biological surveys for sensitive and listed wildlife species as well as vegetation, and produced extensive GIS-based maps to portray survey results. As with the 2000 EIS/EIR, the Corps was the NEPA Lead Agency in this effort, and CVWD was the local sponsor and CEQA Lead Agency. Due to ongoing funding constraints, in 2012 the Corps signed responsibility for engineering and design of the project over the CVWD, which decided to proceed with the project independently of Corps funding. Aspen is currently preparing a joint Subsequent Environmental Impact Report / Environmental Impact Statement (SEIR/SEIS) for the project under contract to CVWD. The SEIR/SEIS will incorporate by reference all relevant information from previous analyses, but will be a separate, stand-alone document, which will be used by Corps Regulatory Division to provide NEPA clearance for CVWD’s application for a Clean Water Act Section 404 permit. In addition, Aspen previously prepared a Preliminary Draft 404(b)(1) analysis for the project, as well as a Preliminary Draft Biological Assessment (BA). At this time it is anticipated that the CVWD will need to obtain a Section 404 permit for the project because the Planning Division is no longer implementing the project, as originally planned. Therefore, Aspen is currently updating the 404(b)(1) analysis so that it can be submitted to the Regulatory Division to support the Section 404 permit application. In order for the Regulatory Division to issue a Section 404 permit, the project must also comply with Section 106 of the National Historic Preservation Act (NHPA). Therefore, Aspen is currently conducting updated cultural surveys of the project area. The Section 404 permitting process further requires demonstration of compliance with the federal Endangered Species Act (ESA); Aspen is therefore updating and finalizing the project’s BA to support Section 404 compliance. The draft BA will be submitted to Corps Regulatory for use in the ESA Section 7 consultation process with the U.S. Fish and Wildlife Service (USFWS). Through the Section 7 process, the Regulatory Division will ensure compliance with the ESA, which will result in the issuance of either a Letter of Concurrence or Biological Opinion by the USFWS. In order to ensure the BA provides adequate information to support the permitting process, Aspen is currently conducting additional protocol surveys. Aspen is also assisting CVWD in coordinating with regulatory agencies and streamlining all permitting requirements, where possible.